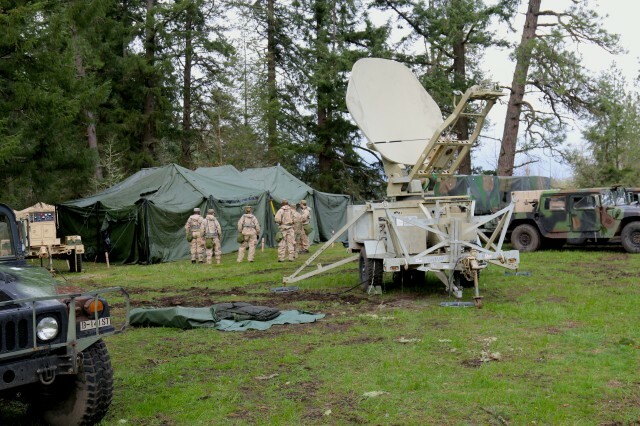 JOINT BASE LEWIS-MCCHORD, Wash. -- The 593rd Sustainment Command (Expeditionary) has completed their unit Culminating Training Exercise at the installation, conducting field operations here from Mar. 29 to Apr. 11. The 593rd has done something no other ESC has, executed a full-scale, field-based Warfighter exercise, to include a physical jump and emplacement of a forward Tactical Command Post. In addition, the Headquarters and Headquarters Company was able to incorporate a variety of training objectives into the 2-week exercise. Warfighter (WFX) 17-04 began with all senior unit staff deployed to a field training site on JBLM working from the 593rd Main Command Post. Acting upon a very detailed exercise scenario, every staff section was challenged with multiple daily requirements and coordination responsibilities to ensure that the command functioned like a well-oiled machine as they would do in combat. "Ultimately, the objective is to ensure that logistics never constrains maneuver freedom of action," said Col. Dennis Kerwood, ESC Support Operations Officer (SPO). The exercise included creating redundant modes of distribution such as rail, air and truck, as well as task organizing distribution assets to forward formations to push supplies as far forward as possible, as quickly as possible. "We took the commanders intent and operationalized it into a realistic training environment much as we would do if a real scenario," said Kerwood. Accustomed to providing sustainment operations for I Corps and JBLM, the 593rd had to adjust its thinking during this exercise as they acted as the sustainment command for III Corps and as the higher headquarters and trainers for the 13th ESC, who fall under III Corps, with both participating in the exercise at Fort Hood, Texas. "I will tell you that we honed our decisive action skill-set by serving as the higher headquarters and seeing another ESC encounter and respond to the fast-paced friction involved in a decisive action WFX," said Col. Mark Weinerth, 593rd ESC's Deputy Commander. The new relationship challenged the 593rd staff, which is exactly what any exercise is designed to do. "Warfighter Exercises are an incredible opportunity for a staff to focus on the 'art' and 'science' of logistics in a decisive action scenario," added Weinerth. To truly replicate deployed conditions, the clock never stopped. The 24-hour battle rhythm required skillful manning of key staff sections in both day and night shifts, which guaranteed constant communication with every unit in the fight. This required a thorough hand-off process every 12 hours to ensure the entire staff was fully aware of the real-time conditions on the battlefield. In reality, 12-hour shifts often stretch to 13, 14 or 15 hours so there is no lapse in understanding of ongoing operations. 593rd ESC Commander, Brig. Gen. Jack Haley, emphasized the concept of being 'Expeditionary' throughout the exercise. In order to train as a truly expeditionary command, he ordered a 'jump' operation, in which key members of each staff section move in teams to a new location. This replicates an Early Entry Command Post (EECP) moving forward into the combat area of operations, leaving the Main Command Post (MCP) in place at the original base of operations. This split operation is the essence and hallmark of a highly-trained, fully proficient command, and 593rd successfully completed the task. 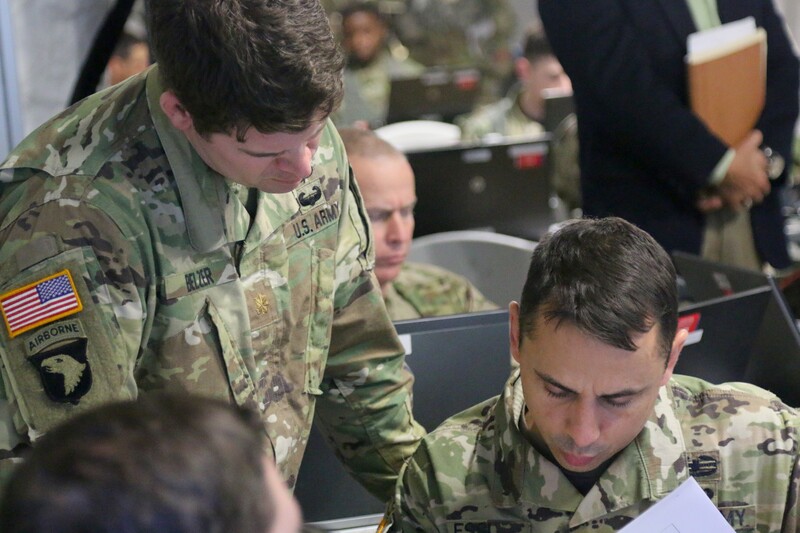 WFX 17-04 marks the end of a series of exercises for the ESC, which began in Aug. 2016 with Ulchi Freedom Guardian in South Korea, followed by Yama Sakura in Japan in Dec. and finally a higher-command role during WFX 17-03 at Fort Hood, Texas in Feb. Along with numerous internal training requirements, these exercises laid the foundation for the most comprehensive exercise the 593rd has ever completed. "All of that work paid off, 'Rest Assured' has never been a more accurate motto," said Col. Mike Wright, 593rd ESC G3 Operations Officer. "We trained extremely hard, demanded much of every Rest Assured Soldier, they responded and the result is the standard, 'what right looks like', for Mission Command Sustainment in a demanding Decisive Action Environment," Wright added. Successfully completing the 9-day scenario in the field, under tactical conditions, while separating the staff and tackling countless challenges, both digital and real-world, truly displayed what the Command has worked for nearly two years to create -- the most highly-skilled, adaptable and professional Sustainment Command possible. This success was lauded by the team of Observer/Coach/Trainers from the Mission Command Training Program at Fort Leavenworth, Kansas, who were present at JBLM to assist the 593rd, watching every movement of every section to give professional feedback on the performance of training objectives. "Everyone learned something during this combined Warfighter Exercise," said Lt. Col. Erik Hilberg, Senior Sustainment Observer/Coach/Trainer for Operations Group -- Sierra from the Mission Command Training Program of Fort Leavenworth, Kansas. "Our team of OC/Ts captured numerous best practices from the Rest Assured Team. When a unit is already highly proficient, that is when it is often the most challenging to make meaningful changes and improvements within that organization, but we were amazed by how the 593rd ESC continually assessed themselves as a cohesive team in order to gain shared understanding and mutual trust," added Hilberg. "We are the only ESC in the Army to do this, and I'm proud of what we've all accomplished, a fantastic job by the entire team," said Brig. 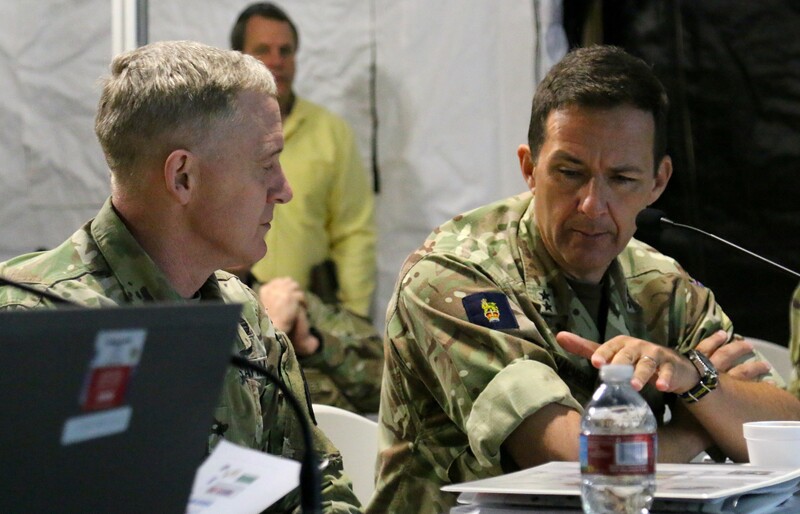 Gen Haley at the final After Action Review at the close of the exercise.